The Coat Route: Craft, Luxury, & Obsession on the Trail of a $50,000 Coat / Meg Lukens Noonan. New York: Spiegel & Grau, c2013. I picked up this book on a sale table one day, recalling that I'd seen it mentioned by -- I think it was DovegreyReader & that it had sounded interesting. So glad I did - it kept me busy for a few enjoyable evenings! 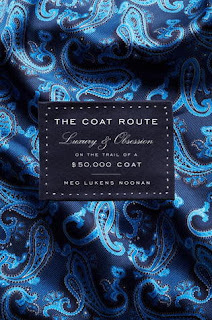 The idea for this book came to the author when she heard of an Australian tailor who had handcrafted what seemed to her an incredibly expensive overcoat for a private client. She looked into it, and was intrigued by the whole process. So she followed the route it took from raw materials to finished coat, interviewing vicuna fur suppliers in Peru, investigating Italian silk merchants, visiting British button factories & Savile Row, and much more -- including of course, long talks with John Cutler, the master tailor. And a final visit to the coat's purchaser, a Vancouver based businessman, in which she finds the infamous overcoat casually slung across the back of a chair. It feels like an entire collection of microhistories. It is perfect to read chapter by chapter, as each one is a complete story in its own right -- I feel like following up on one or two of my favourite bits, as they are just an introduction to a fascinating topic. I think that some of these chapters could be expanded into full books on their own! I really enjoyed dipping into this one, and after reading about the vicuna cloth, the silk lining, the gold engraved tags, the horn buttons and all the tailoring itself, the cost of this coat seems quite understandable. It is valued according to its actual value; and seems in line with couture and designer clothing prices, even while being utterly customized to the buyer. So while something like this would never be found hanging in my closet, I found the steps toward its creation wonderfully interesting. I'd recommend reading this book bit by bit and allowing some time in between chapters, as it can feel a bit too much of a good thing when read all in one go, like I did. Her writing voice is very much "reportage", like the journalist that she is, without many stylistic frills to smooth out the narrative. It works, but for myself, a break in the matter-of-fact telling was needed. I wanted to imagine the story developing as it progressed, and taking a day or two before reading the next chapter was perfect. Any reader who is also a sewist would find this one intriguing - so many different industries involved in making up this one item, and all of great interest to those who stitch. Recommended! The author presents a lecture on this book at the Portland Art Museum in celebration of their 2015 exhibit: "Italian Style: Fashion Since 1945"
I'll have to see if my library has the book. We had a woman come speak to our sewing group a few years ago who works for a bespoke tailor here in Chicago. She brought some of the fabrics that they use. Incredible! The fabric alone was worth thousands. She said that customers actually insure their clothing. I had the opportunity to see the exhibit in Nashville and hear the curator speak. Wonderful! This sounds so interesting! Thanks for a new book to put in the reading queue. It's a great one to dip into as you have time. Each chapter is like a mini-essay.